We hope you’re enjoying a busy start to the new school year. To make life a little easier for you, we’ve changed the knowledge base, look and feel of our Help Desk; Zendesk. It’s now easier than ever to find what you’re looking for with the new sections we’ve added! Day to Day Use – This section gives you a guide to the ins and outs of using CoursePro for your lessons and general use. HomePortal – This section explains every function of the HomePortal element in CoursePro. Payment gateways – Zendesk will now guide you through how to set up the different payment gateways we work with. Schools Programme Manager – If you’re stuck or in need of assistance in using Schools Programme Manager, we’ve provided a detailed support guide to the system. You’ll now be able to ask for help by using our Support Request section. If there’s any specific support you need that our new Help Desk cannot help you with, then you are more than welcome to make a request in the Support section. 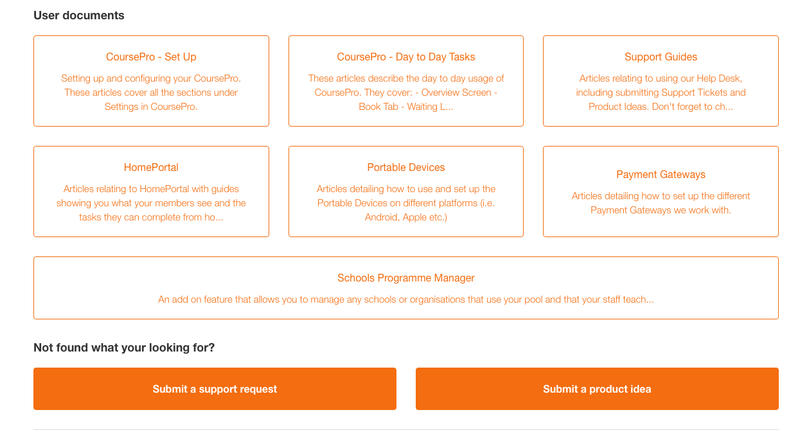 You can also now see other customers’ ideas for how CoursePro should be improved via the new Product ideas section. You can view and vote on current ideas, and if you don’t see something you’d like, then you can create your own. If you’re having trouble logging in to your Zendesk then visit our support page at http://www.cap2.co.uk/support/ . We’re here to make life easier! So we hope all this helps you, when you’re stuck or looking for quick and instant support.